The above is the color combination that I have chosen for my next hidden treasure yarn. I plan to knit it up myself, so people can see what the yarns will look like. I sold a lot of the novelty yarns this past weekend, but some friends told me that they really want to see what it would look like. I have this thing about taking yarn from the shop, so I chose a set of colors today. 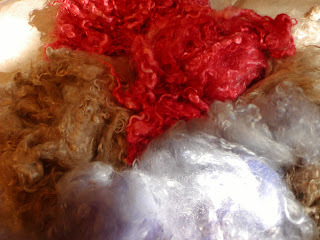 I already have the hidden treasures and now am carding the kid mohair. Since I do not have wool in these colors, it will be all kid. Just what I love to play with! I told myself that I would do at least one of the novelty yarns from the Pluckyfluff Camp each week, so I don't forget how to do them. 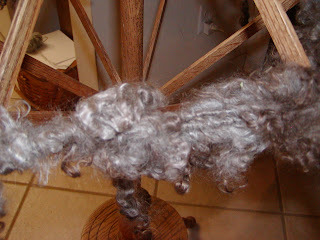 This tailspun is not my favorite type of spinning, but the natural color of the red kid mohair with the really dark tips called out for it. I don't know whether the color looks quite right in the photo, but it is only 5 yards long and took forever! Really soft. Will have to think how I could use it, if it does not sell.